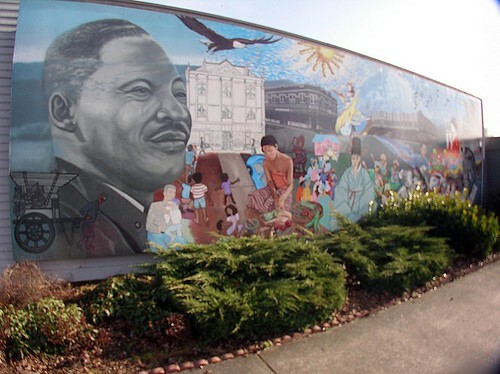 This MLK day I thought I'd take the time out to stroll down MLK street with my son. I wanted to make a point of documenting all these multicultural murals I pass by everyday on the bus, but had never taken the time to examine up close. GO OUT AND Enjoy this beautiful day! by jenyum on 1/18/2010 @ 6:44pm Looks like a great way to spend a sunny day. People's Park is fun, has the perfect size hills to roll down when you are in preschool. by L.S.Erhardt on 1/18/2010 @ 7:04pm Nice photos, but I see nearly no human life. by Erik on 1/18/2010 @ 7:13pm Cool! by NineInchNachos on 1/18/2010 @ 7:55pm there was human life. Just not the kind you see in a condo design sketch. by Altered Chords on 1/19/2010 @ 7:51am Do you really need to be in pre school to roll down a hill? I think I can do it. Hill rolling contest anyone? Easier than bocce. 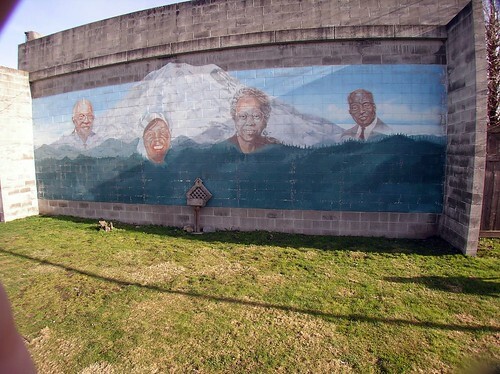 by fredo on 1/19/2010 @ 9:50am Why does the mural of the four black leaders have a urinal in the middle? That's just wrong. by L.S.Erhardt on 1/19/2010 @ 2:59pm It's a water fountain. Hey, does anybody know how the turnout to celebrate Robert Downey Junior day was? by NineInchNachos on 1/19/2010 @ 4:16pm man all you guys are wrong. it's a garden flower stand thingy. by L.S.Erhardt on 1/19/2010 @ 4:22pm there are no flowers in January. by jenyum on 1/19/2010 @ 5:22pm It's the perfect size to roll down, if you are in preschool. I did not mean to in any way imply that one cannot roll down hills as one gets older. by ixia on 1/20/2010 @ 11:03am Plenty of flowers in January, just gotta look! Try the winter garden at the Washington Park arboretum. Delicious!